Barely a month after the deadly shooting in Colorado which killed 12 people, six more lives were lost to another maniac with a gun, this time at a Sikh temple in Wisconsin. Yet, like the earlier shootings, the whole episode is destined to quickly recede into the background. For all its greatness, America is a nation that is easily distracted by the trivial at the expense of the critical, a nation that can barely hold its collective attention much beyond the 30 second sound bytes of its newscasters. It is one of the many paradoxes of America. Consider, for example, that the death of 3000 people on 9/11 became the jumping-off point for more than a decade of war that cost thousands of lives and billions of dollars, whereas the 140,000 or so lives lost to gun violence since then has elicited no corresponding outrage or demand for action. I suppose it’s always much harder to confront the enemy within than the enemy without, easier to go after strange men in far away places than face an ugly truth closer to home. Besides, the gun culture is so much a part of the American fabric that to confront it is to challenge the way America thinks about itself. Almost all of America’s great heroes were gunslingers or men who cut their teeth in war. Guns are so much a part of society that pastors preach about the right to bear arms while banks give them away to good customers. Even the courts have let stand the so called “Stand Your Ground Law” which basically gives citizens the right to use deadly force when confronted by an assailant even when such force is unnecessary. Talk about a licence to kill. Perhaps, there is a certain fatalism as well; a resignation that such senseless killings are the necessary price Americans must pay for their cherished right to bear arms. 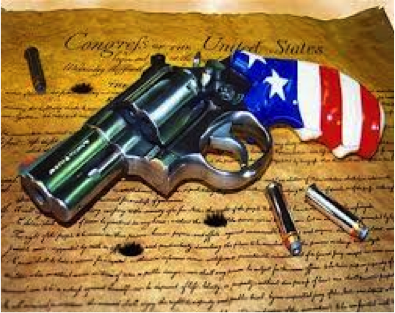 What is incomprehensible, though, is the frequently used argument that a well-armed population is the best protection against government encroachment of individual freedom. It might have been an appropriate response in the aftermath of their war of independence 236 years ago but it makes no sense today. The gun culture is largely sustained and promoted by the all powerful gun lobby and the arms manufacturers who fund them. Guns are a USD 31 billion industry that brooks no interference. Their power to destroy anyone who challenges them is legendary. Even simple calls for more stringent background checks on prospective gun buyers are enough to send them on the offensive. Unsurprisingly, most politicians go out of their way to avoid offending the gun lobby, especially in an election year. President Obama, for example, has offered communities affected by recent gun violence the sympathy of his heart but not the power of his office. Even his prospective Republican challenger, Mitt Romney, one of whose signature achievements as governor of Massachusetts was a ban on assault weapons, has been cowered into silence. And so they talk endlessly about the need for better mental healthcare for troubled young men or promise to begin a “conversation” about guns in America instead of actually taking the bull by the horns. It is escapism and denial on a staggering scale. The gun lobby, meanwhile, continues to push the asinine argument that it is not guns but people who kill. Society has long recognized that cars, for example, can kill and maim if not used properly and have come up with stringent regulations replete with a licencing system to control and regulate its use. No such rules apply to guns which can be bought legally by just about anyone and carried just about anywhere. And not just handguns but assault rifles and other military-type weapons. There’s also no limit to how much weaponry a citizen can amass. It is estimated that there are more than 300 million privately owned guns in the US (population 314 million), making it the most heavily armed civilian population in the world. Most Americans, however, do not own guns; the numbers are skewered because most gun owners tend to stockpile them. And perversely, every time there is another mass shooting, gun sales actually explode, as people rush out to buy yet more guns. Indeed, gun sales rose 40% in the aftermath of the recent Colorado shooting. The other thing about such shootings is that it shines a spotlight on the deep alienation of a rootless and disconnected generation brought up on video games, movies and music that glorify gratuitous violence and anti-social behaviour. When unstable young men, to whom killing is probably just another video game, have unlimited access to the most lethal weapons, can there be any doubt that carnage is inevitable? We shouldn’t be surprised, therefore, to see more and more heavily armed gunmen emerge from the shadows of their dark and dreary lives to carry out mass murder as the ultimate thrill, the final expression of their banal existence. Until Americans are willing to confront the power of the gun lobby and demand that their leaders show some political courage on the issue, America will remain a killing field.